In the first two sets it was clear that Djokovic was the superior player and that Anderson was gassed from his six-hour semifinal. The Serbian broke Anderson four times in the first two sets including taking the opening game from Anderson in each. It wasn’t until the third set when Anderson finally got his legs under him and started to give Djokovic trouble. Anderson had five set points but wasn’t able to convert and in the tiebreak, it was Djokovic who came out victorious. It was all about efficiency for the Serbian who landed 72-percent of first serves in and won on 76-percent of them. He was able to convert on all four break point opportunities and recorded just 13 unforced errors. Djokovic’s serve was on as it has been the whole tournament and with a tired Anderson, his legendary return game was as solid as ever. 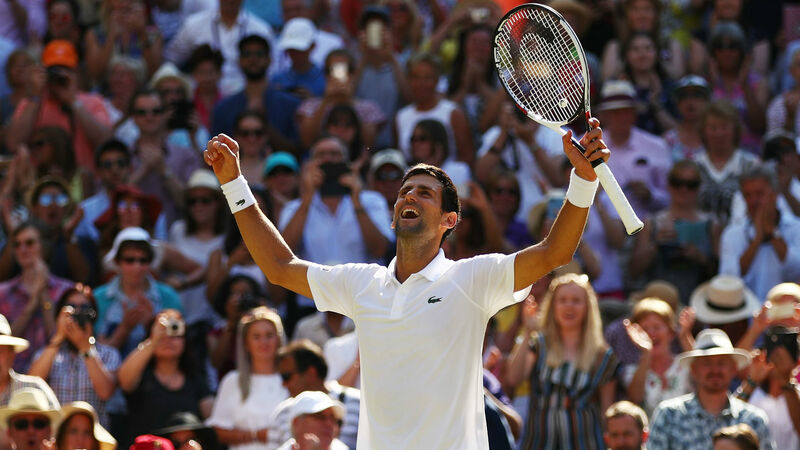 After a few years where it looked as though injuries might derail the career of one of tennis’ best, Djokovic is clearly back after winning his fourth Wimbledon title and his 13th Grand Slam. This put him one closer to Pete Sampras’ 14 which would land him behind just Roger Federer (20) and Rafael Nadal (17) for most all-time major wins. This win will also vault Djokovic back into the top 10 of the ATP rankings. Below is a recap and highlights from Djokovic’s big win over Anderson. 11:41 — Hold it high, Novak. 11:30 — That’ll do it. Djokovic converts on championship point at 6-3 and wins the 2018 Wimbledon title. 11:27 — On the crossover it’s Djokovic up 5-1. Playing terrific defense in this tiebreak. Two points away from a fourth Wimbledon title and a 13th major. 11:22 — Anderson gets a fourth and fifth set point on Djokovic but he fights both off to hold and they’ll head to a third set tiebreak. 11:13 — And a quick, four-point hold for Anderson who looks like the player we saw earlier in the tourney. He has Djokovic sweating a bit now. 11:10 — A costly double fault from Djokovic gives Anderson set point at 30-40. With a beautiful rally Djokovic gets it to deuce and after another double fault and another set point for Anderson he finally gets a big hold at 5-5. 11:01 — Anderson is feeling it now. Six aces in this set and caps off another hold with a beauty of a backhand volley just over the net. 10:57 — Djokovic won on all 12 previous service points but it goes to deuce this time around on some stellar returning from Anderson before an eventual hold. 4-4. 10:51 — Anderson looking much better now. The serve is back on and his groundstrokes have improved greatly. Holds at 4-3. 10:47 — Djokovic mixing it up with his groundstrokes beautifully to hold yet again in four points. 10:44 — Djokovic gets close to a break in the third set but Anderson’s serving gets him a third straight hold in the third. 10:39 — And another hold for Djokovic on four straight points. Gets some speed on a pair of serves clocking in at 120-plus to close it out. 10:36 — Anderson getting some ground now and holds again. Strong serving and baseline shots. 10:33 — A quick hold for Djokovic on four straight points. 10:29 — Third times the charm. Anderson is able to hold on his first service game of the third to give him a 1-0 lead. Serve looking better (80-percent first serves in and 100-percent won). 10:25 — Djokovic kept it rolling in the second set with a 75-percent conversion rate on his first serve but did add a few more unforced errors to his total (6). Anderson got his serve going at 64-percent but only winning on 50-percent. The unforced error tally grew even higher though with 14 (25 total). Just over an hour in. 10:24 — A couple of great returns and a few impressive rallies from Anderson gets it to deuce but Djokovic settles in and win the game and set. 10:17 — Some big serving from the South African gives him a much needed hold. Djokovic will serve for the set though. 10:14 — Meanwhile Anderson breaks another Wimbledon record after that last game. 10:12 — Anderson comes out swinging with some terrific groundstrokes and pushed Djokovic to deuce but the Serbian rattles off some sharp serves to hold. If he can break again he’ll have the second set. 10:06 — Anderson gets himself into some trouble with a double fault and goes down two break points and is subsequently broken for the fourth time in this match after his 22nd unforced error. In comparison, Djokovic has four. 10:02 — Another Djokovic service game and another 40-15 hold. Another rather quick set here so far. 9:57 — Anderson get his serve going and opens at 30-0 but Djokovic gets it to deuce. The South African still manages to hold after several deuce points. 9:50 — More steady serving from Djokovic who marches through another hold with ease. 9:46 — Djokovic goes up 40-15 then breaks again to open the second set. He’s three for three on break opportunities. 9:41 — Anderson had some decent shots there but no real threat as Djokovic takes the hold and the first set with ease in just 29 minutes, 6-2. Djokovic won 16 of 19 points on his serve while Anderson already has 11 unforced errors and knocked in just 45-percent of his first serves. 9:36 — The serve looks better for Anderson now and he aces Djokovic to grab a hold. Djokovic will serve for the set now. 9:32 — Another quick Djokovic service game and another hold. Anderson has requested a trainer for his elbow. 9:30 — Djokovic’s return game cannot be understated. He’s giving a clearly tired Anderson all he can handle and breaks again. 9:27 — The Avengers are in the stands at Wimbledon today. 9:26 — Djokovic’s serve has looked sharp all tournament and that hasn’t changed today. Another hold for 3-1. 9:21 — Anderson serves better in his second service game and handles Djokovic’s returns nicely for the hold. 9:19 — Great serving from Djokovic who holds to go up a break to get this one started. Six unforced errors for Anderson already. 9:15 — Not a good start from Anderson. First serve drops in just twice all game and he double faults on 30-40 to give Djokovic the opening break. 9:10 — They’re ready to go. Anderson serving to Djokovic. Here we go. 9:05 — Players are on the court warming up now. Anderson won the toss and will serve first. 8:45 a.m. — About 15 minutes until showtime. In case you didn’t already know these two have spent quite a bit of time on the court in this tournament.